"November sees Brockenhurst parkrun's return to Wilverley for the winter months, and on November the 5th Hardley president Mick Anglim took charge as Run Director for the 100th time. Mick's contribution to parkrun, Hardley and running in Hampshire has been incredible and at Brockenhurst parkrun we all wanted to say a big thank you! Balloons were tied around the start/finish area, an enormous array of cakes including a special apple pie were shared. Before the start Mick received a card signed by all the regulars with a well earned round of applause. Our parkrun is a fantastic part of our community and we value it, and Mick, enormously." And nearer home, there's a film coming out soon about Nicky Spinks' double Bob Graham round. At the age of 49 she took an hour off the previous record back in May. You can see a trailer here. Just one final note,Club Chairman, Adrian Mudle, writes, "There are several members who have not paid this year's membership, please click here if this is the case to renew your subscription. Tere will be a final reminder coming out soon going only to the non paid up members, those who have not paid after this notification will then be removed from the data base, and attendance at all club events (training, social runs, CC6, RR10 etc) will declined. Obviously you will be one of those who have paid up and can ignore this paragraph. Mara Yamauchi visited Hardley Runners on Monday 4 July 2016. 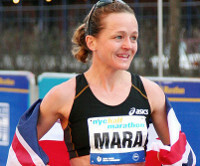 Coach, Chris Harris, writes, "On Monday evening Mara Yamauchi, the second fastest British woman marathon runner with a time of 2 hrs 23 min's 12 sec's visited Hardley Runners to present and coach a track session. Approximately 40 athletes came along, this included run leaders and coaches. 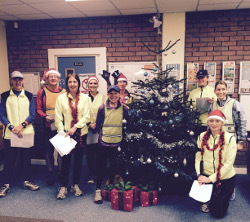 This was an evening when three different local running clubs worked together , exchanging ideas & running tales! Following a comprehensive track session, the aim "to sharpen the athlete before competition" was carried out with confidence and skill by Mara, introducing many new ideas for one and all. A question and answer session then took place, lasting for an hour. Runners are always very talkative, following a good run and there was no shortage of questions for Mara, who answered practically and with sound knowledge. A huge thank you to Mara for carrying out an excellent, appropriate and enjoyable session, not forgetting to say thank you to Chris Benning and Run England for enabling this workshop to take place. Chris." Brockenhurst parkrun started on 25th May 2013, and since then 3,306 different runners, including participants from 407 athletics clubs, have completed 12,126 runs covering a total distance of 60,630 km, and there have been 2,238 new Personal Bests. Behind those raw statistics are lots of personal achievements and a huge number of Volunteer roles. Each parkrun recognises the support and participation of all involved in every event. That's done formally by awarding 100 points to each of the male and female First Finishers each week reducing to 1 point for the 100th finisher in both genders. 100 points are also awarded for the first three Volunteer roles each year. At the end of our 3rd year Ian Smith of Hardley Runners was almost 600 points clear of Mark Riding despite Mark having run a very impressive 48 times at Brockenhurst parkrun last year. On the Ladies table it was much closer with Katrin Pritchard of New Forest Runners pipping buggy pushing Charmaine Bradford of Hardley Runners by 200 points. Runners and Volunteers are also rewarded with free technical T shirts on completion of 10 (under 17s only), 50, 100, 250 and 500 runs or 25 Volunteer roles. One aspect of our parkrun that is particularly rewarding is that there are many families that turn out regularly to run and volunteer together. The College course is particularly suited to Juniors as it is secure and totally visible with 4 flat laps that promote encouragement and support. Of the local participating clubs it is New Forest Runners who dominate in both numbers and results. Their 200 runners at Brockenhurst equal the total of the next four local clubs! On the First Finisher tables NFR also dominate with Chloe Woolf on 20 first positions closely chased by Frank Handy with 18. The Forton Village Idiots are doing Endure 24 (again). We thought it was pretty epic until we heard about the Everest Mailrun. I've put this article in as I thought you might be interested. If you also feel inclined to chip in then that's brilliant but please feel no obligation. Nowadays you can phone home from the top of Mount Everest but when Hillary and Tenzing first climbed Everest on 29 May 1953, the news was brought down by a runner. Sir Ed decided to help the local people and in 1960 he founded the Himalayan Trust which has worked since then to improve the health and education of the people in the Everest region. When I did the Everest Marathon four years ago I visited a school founded by Sir Ed which was quite an inspiration. Jamie Ross Mackenzie was one of the people on that Everest Marathon. The following year he went back and did it again. Last year the Marathon was cancelled because a devastating 7.8 magnitude earthquake struck Nepal on 25 April, followed just 18 days later by a second large earthquake. Almost 9,000 people lost their lives, over 600,000 homes were destroyed, and key infrastructure such as schools, health facilities, temples and roads was severely damaged. Lots of people gave to help with the immediate aftermath of the earthquake but a year later there's still a great deal to do. So Jamie is going back and doing the marathon again to raise funds for the Himalayan Trust. And then he's carrying on. 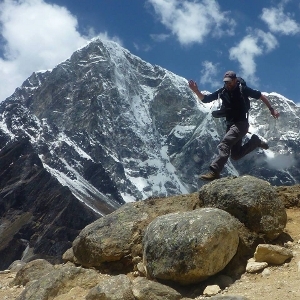 He is aiming to run the full distance of the Everest Mailrun route in one continuous attempt. The start will be on Sunday 29 May from the high altitude of 5,350 metres at Everest Base Camp in Nepal. The route crosses the mountainous Solukhumbu region to Kathmandu, covering a distance of 320 kilometres (200 miles). Jamie aims to break the current record of 63 hours and 8 minutes, set in April 2013. The record attempt will raise funds for the work of the Himalayan Trust in the Solukhumbu region of Nepal for reconstruction work after last year's devastating earthquake. Every penny donated goes directly to the Trust. If you'd like to support the excellent cause you can give online via this Kiwi website. They take credit cards and it is very easy. You have to give on New Zealand dollars which are roughly two to the £1. There are links at the bottom of that page if you'd like to find out more about Jamie's epic run and the Himalayan Trust. opportunity to raise funds for the charity Prostate Cancer UK. This has significance to me as I have previously had two Prostate operations. At least one man dies from Prostate Cancer every hour in the UK so all funds raised will be put to good use. I have set up a "just giving" page. The details are: http://www.justgiving.com/Michael-Delauney "
A pleasant 8 mile run led by Ray, in ideal running conditions, burning off the calories before the awards lunch. A great day and many thanks to all those who help to organise (Steve Henry) and to those who turned up for just the run, lunch or both. Must say we where a bit outnumbered by the ladies on the run, and we did eventually split into two groups, though one would have said the steady group was held back by the talking, the faster group did manage to give them a run for the money on that front and I'm not saying who did all the talking in this group. Welcome to Hardley's Newest Member! Liz Young writes, "Thought you might like to know Baby Oliver was born 8 April (ONLY 12 DAYS LATE!!) at weighing 7 pounds with a fine head of hair! After emergency C section it will be a while before I can run unfortunately but we're all well and enjoying Spring." Congratulations Liz and Tim. Best wishes for a speedy recovery and we hope young Oliverallows you to get some sleep! Hardley President, Mick Anglim has won the M65 European Sprint Duathlon Championship title. Well done! Mick Anglim of Hardley Runners has won a 3rd consecutive M65 British Duathlon Champion title in his final year in the Age Group. The event was held in Windsor Great Park on a cold but dry morning with over 200 Sprint competitors starting only 3 minutes before the 500+ Championship contenders. The first run was 10.5k with the final third off-road through the scenic but muddy woods and fields of the estate. Due to the huge number of competitors the transition area resembled a cross country course with many having to stop to clear mud from close clearance frames. The cycle leg was 4 laps of a narrow, undulating and twisty 10k loop with over 700 cyclists for the first two laps. With a massive disparity in cycling speed there were several collisions including Eastleigh’s Sam Aplin who had her wheel broken and had to withdraw. Club mate Aleks Burlinson was 6th W55 in 2h 51m and her son Miles was 2nd M20 in the Sprint race in 1h 37m. Chloe Woolf of Lymington Triathlon Club and New Forest Runners was 14th W30 in 2h 42m, just a day after leading the ladies home for an impressive 17th time at Brockenhurst parkrun to head the First Finish table there. Despite the freezing weather the GB Duathlon season started last Sunday with the first qualification event for the World Sprint Duathlon Championships which will be held in Northern Spain in June. A fundamental change to the rules for the latter event means that for the first time Age Group Duathletes are able to 'draft' each other on the bike leg as the Elite competitors have always done. That led to an exciting competition with groups of cyclists powering around the undulating 4.3km Oulton Park motor racing circuit. Unfortunately the conditions were tough as it snowed just before the race and competitors were forced to dress well for the freezing conditions. The Sprint race consisted of a one run lap, followed by 5 laps on the bike with another run lap to finish. Mick Anglim of Hardley Runners didn't have the best preparation as it was 1am before he left Gatwick airport after a late flight from a 20C and sunny Algarve. With only 3 hours sleep his first run was 'steady' and he was only 4th M65 into the first transition. Suitably warmed up he was then fastest on both the bike and second run to win the M65 Age Group in a total of 1 hour 18 minutes, over 2 minutes in front of another ex World Duathlon Champion. That win means that Mick will be representing GB in the World Duathlon Championships in Aviles where he'll be joined by son Brendan who also qualified for GB in the M45 category. 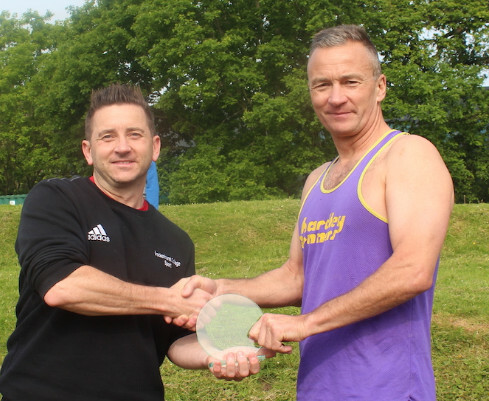 Ian Wells of Brockenhurst competed in the Standard Distance Duathlon and came second in the M60 category. The results can be found here The picture shows Mick well protected from the cold with another competitor drafting behind. Chris Harris writes, "Thank you to everyone who took part in the Tinsel Run on Tuesday & for making this such a jolly event. Although the focus is sound , rather than endurance we did manage to run 8 miles, with a respectable pace! We were well received by Badgers Holt Rest Home , who once more joined us for the singing , making the whole session lively & fun! A final huge thank you to Rachael , Jake and Ilya for making us so welcome in their home. The delicious mince pies were quite the best!" The Marcothon - are you up for the challenge? The idea is very simple. All you have to do is run at least 3 miles or 25 minutes every day in December. It is not a competition; it is a personal challenge. Three Hardley runners, David Gould, John McKenzie and Jeremy Barber did it last year and are doing it again this year. How about you? You don't have to be fast; just persistent! Instead of putting on five pounds over Christmas last year your webmaster lost two so there are immediate benefits. You can see more on the Marcothon Facebook page. If you decide to give it a go then maybe you might record your progress on our Facebook page to encourage others and keep you honest? CC6 Captain, Ian Ordish, writes, "Thank you once again for your help and support today. It is a fact that these events would never start without the volunteers, especially on a cold morning like the one we had today. The comments I receive always talk of the warm and genuine support offered by our marshalls, a complement we are never tired of hearing. I personally would like to thank my lead marshalls and parking supervisor. If we don't lose anyone and we have no disgruntled motorist then it's a good result and they delivered on both fronts. Wow!!! Even Mary Berry would have been impressed by the quality and array of cakes on offer at the end of our race today. thank you so much to everyone who contributed with baking. Here are some pictures. If you'd like a full size (about 4MB) copy of any of them please email the webmaster. The three Hardley Runners (Mark Darcy, Paddy Butler and Adam Court) competing in the New Forest Sprint duathlon on August 23rd won the prize for first team home. 5k run/24k bike/5k run. Well done! Every year Hardley Runners are allocated places in the London Marathon. This year the ballot and the allocation was changed resulting in the club being allocated only one place. As in previous years the place has been awarded based on a points system from your support in the club races, and volunteering at club events. The place for 2016 has been awarded to Paddy Butler. Good luck with the training and the race. The third Biathle World Tour championships of the year took place in Europe under the hot Portuguese sun in Setubal’s Parc Urbano de Albarquel. The conditions were very tough and the strong sea current made the swim part of the race even more demanding. 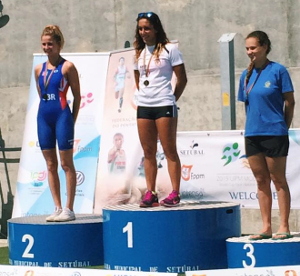 Natalie Green from Hordle, Lymington represented GB in the Junior ladies race and against some strong completion from the Portugese and especially the Italians achieved a fantastic silver medal with a very strong run throughout the race. The Great Britain team of 69 Biathletes competing against a field of over 260 competitors from all over Europe take home a total of 24 medals, 8 gold, 10 silver and 6 bronze – congratulations to them all. Well done! You can read a report of the event here. And if you'd like to see Natalie in action click here for a series of pictures of her accelerating towards the finish in the closing stages of this year's Lordshill 10K. With one race to go there's no-one in the M70 category who can catch Mike Clarke so he is the winner. Well done! Click on the picture to see him in action. Many people who run in the forest acquire ticks. Often you don't notice until you are having a shower or bath after the run. They are persistent little blighters and hang on like mad. Trying to pinch them off just breaks them and leave the head attached, burning them off with cigarettes is both painful and ineffective and smothering them with vaseline just seems to demonstrate how hardy they are. It is important to remove them whole as they sometimes carry infections including Lyme Disease. There is an easy way to remove them. Tick twisters are a wonderful invention and 100% effective at removing them all. See http://www.amazon.co.uk/dp/B0037DFYRQ/ You can read more in this leaflet from the Lyme Disease Association or this one from the NFDC. This is a pretty rare plant and not to be confused with cow parsley but you don't want to mess with it if you do come across it. Its sap can cause your skin to become extra sensitive to sunlight resulting in painful rashes and blisters. There's been quite a bit about it in the press recently. See for example this article in the Daily Mail. Here's an Echo article about it growing in Sway The best information leaflet I could find is this one from New York. Coincidence has a long arm. The techncial word for this is photodermatitis but the common name is Lime Disease. If you would like to donate to this worthy cause, go to the team's Oakhaven giving page. Well over £2,000 has been raised already. The 2014/15 season finished with the D-Day 10K. Thanks very much to everyone who turned out for our Club in any of the races. Our women's A and B teams were 6th in Division A2 and 8th in Division B2 and our men's teams were 7th in Division A2 and 5th in Division B2. Individual honours for a top 65 place in the combined results go to Lynn McDonagh 26th, Alice Ryder 37th, Kimberley Shiels 65th and Matt Tanner 43rd. Well done to all concerned. Our thanks go to Kim Shiels and Steve Henry for organising a very enjoyable Awards lunch at the Beaulieu Hotel. A 3 course meal was enjoyed after a run or walk in the forest around the hotel. The weather was perfect without the rain that was forecast for later that morning. The winner of the predicted time handicap run, held at Christmas, was Mike Sleath, who was 1 second away from his predicted time. Rob Wells won the 'Lanterne Rouge' by being the furthest from his predicted time. As he was 9 minutes faster this was felt to be an achievement in itself! The Geoff Mills trophy, which is awarded to the club members who take part in the greatest number of races through the year, went to Chris Harris and Adrian Mudle. Geoff himself was a most prolific racer until 80 years of age. The 'Navigators Hat' went to Linda Noke, who was voted as the person who got lost in the most dramatic way in the year for her performance on the Test Way Relay. Club President, Mick Anglim's erratic performances over recent races are due to a persistent Achilles problem which was not improved by two European Duathlon Championships which involved a 3,500 mile motorhome trip through Holland, France and Spain. The Long Distance Championships were held in Horst, Holland and Mick ran the 10km lakeside run in 42 minutes followed by a windy 60 km bike ride through narrow country lanes before repeating the 10k run. He had a lead of almost 4 minutes after the ride but his Achilles problem reduced him to a shuffle for the second run which took over 50 minutes! He was passed by a Frenchman and lost the M65 European title by just 32 seconds in a total time of 3 hours 21 minutes. You can see the full results here. It was then a leisurely drive to Madrid for the European Sprint Duathlon Championships. The course and conditions in Alcobendas were in total contrast to Holland. Both the run and bike courses were very hilly and tortuous with 11 roundabouts on the bike course. Rain made the ride even more treacherous with many crashes. Adding to the challenge Mick's tri bars broke on the first 40mph descent which meant that every gear change required the tri bars to be lifted. Despite the bike and Achilles problems Mick won M65 Bronze, only 40 seconds from Gold. The full results are here. This consisted of 14.1 miles through a beautiful albeit undulating German forest as highlighted in my previous ‘postcard’. I ran it hard and was rewarded in 20th place and a time of 1:51. When the current Elmpt Station was previously the home of RAF Bruggen (which closed over a decade ago), the RAF always organised their iconic 10 mile road race inside the grounds of the Base. When the Army moved in after the departure of the RAF, the race continued to survive and it attracted up to 800 runners every year. With Elmpt Station closing for good this summer, this was the last edition of the Bruggen 10 (although the Army had to make a point of calling it the Elmpt 10 for the final version) and I just had to participate. The final race accepted 200 runners and I was the only guest (from outside Elmpt) allowed to enter due to my work with Bruggen School . I was delighted to run the course which was a mixture of roads within the Camp but passing round the former airfield and the superb local golf course. I ran it hard and even surprised the young Army lady at the finish (I was 14th in 69: 15 ) who was shocked at seeing this ‘old’ chap coming in front of all the fit (?) much younger soldiers! Sadly, the Army only has one veteran age group, over 40, so I was second in this class! That being said, the first veteran was only 41 so I was giving him 12 years so had little hope of beating him! Highlight was finally running this race and getting the coveted race T- Shirt! Thanks and Goodbye to RAF Bruggen/Elmpt Station. 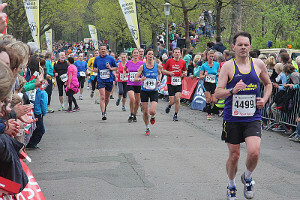 The Hermannslauf – from the Hermannsdenkmal monument near Detmold to Sparrenburg Castle in Bielefeld – makes April 26th 20 15 a running event for everyone. With an overall distance of 31.1 km, it has delighted an international field of runners every year for more than three decades, as well as thousands of spectators along the route full of natural beauty. So, the day after the 10 miler, it was time for my 4th running of the Hermannslauf. This is a really tough trail race over 31K (19 miles) through the most superb forest on wonderful trails but with some absolutely beastly hills on route. This is one of the post popular races in Northern Germany . Entries always open (online) on the first Sunday in January at midnight and by 8am the same morning, all 8,000 places are sold out! It really is that popular! On race day, it’s a massive logistical exercise because all 8,000 runners are taken from Bielefeld (where the race finishes) to Hermannsdenkmal (race start) near Detmold by coach! It’s quite a sight early on a Sunday Morning in April seeing 8,000 runners being coached to the start. With so many runners having to be moved to the start, there is a problem! You tend to get to the start at 8am but the race doesn’t start (in 3 separate ‘waves’) from 11am. This means a long wait up a big hill (365metres) often having to wait in the wet and cold! However, this year the organisers had arranged for runners to pay an extra 12.50 Euros to sit in a lounge near the Hermannsdenkmal Monument to have breakfast and keep warm. That was the best 12.50 Euros I ever spent in Germany (and I was quick to get in as there was only space for 300 of the 8,000 runners). After some nice food and sleep in the warm, I made my way to the 11.05am ‘wave’ start. The start tends to be slow for the first 2 kilometres as the forest trails are quite narrow but they soon open out and you can get into full flow – assuming your body will allow that of course! The route was a delight and I ran it well although the last 10K was tough due to the other hard races I had recently completed. I finished just inside 3 hours which is a wee bit slower than previous efforts but I was more than content. I have attached 3 photos of me in the final 100 metres wearing my club vest – of course. Next year will probably be my last year in Germany and my last opportunity to run the Hermannslauf. If anyone in the club fancies running it, I will happily arrange a weekend break? Have a look at www.hermannslauf.de and I’ll be happy to provide more details at a later date. So, what next for me? In June I have a local German half marathon at the start of the month followed by the final ever Army organised Gutersloh half marathon on 27th June. 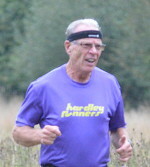 The Hardley Runners vest had a second wearing in Northern Germany on the 18th April. This time I was participating in the annual Army organised "Bismarck Challenge" - 14.1 miles of trail racing through a beautiful but very, very undulating forest. This race was very special because it was the last time it will be held. It has been organised every year by the Army in Germany since the end of World War 2 but with British Forces leaving Germany over the next 3 years, this was the final outing. The event started and finished in Wentworth Barracks, Herford and this summer, all the British Army in Herford will head back to UK, mainly to Stafford and Catterick. The route was a strange distance, 14.1 miles, and the only flat section of the course was the 0.1 mile - i.e. the start and finish on the sports pitch in the Barracks. There were in fact two races. The first comprised Army personnel running with fully loaded rucsacs and wearing Army boots for the whole distance - I'm glad I wasn't in that race as it was hard enough just wearing the vest and running shoes! My race comprised a trail race and apart from that start and finish, the whole route was running up very steep hills or down them. At one point, I thought I was in a fell race - it was that hard. Luckily, my fitness paid off and I ran hard the whole course finishing 20th out of 154 in 1:51. That felt good. Even better running past fit Army personnel! For 15 Euros we got a super goody bag with a finisher shirt, drinks bottle, lots of food, drink and a frizbee! Next weekend - it gets tougher with the final ever Army Bruggen 10 mile road race on Sat, 25th April and annual German 31K Trail Race, the Hermannslauf on Sun, 26th April. Finally, well done to Alice for her Brighton Marathon run and good luck to those doing the first all new Southampton Half Marathon and the London Marathon on the 26th April. By way of introduction, I have just joined the club from here in Germany! My best friend is Terry (Earney) and he 'sold' the club to me - sounds great and I look forward to joining you when I leave Germany (I work for the Ministry of Defence) in 2016. I first met Terry in 1986 when he transferred from the MoD in Liverpool to Porton Down. We started running together at work at lunch time then and have shared many happy times since. Terry is an inspirational guy and motivates me to run well which he does all the time - he is the ideal man to have in the club to inspire runners of all ages. His race times today are just as good as many years ago when he started running - amazing! Last year I had my worst running year since I started in the 1980's due to work load and broken bones and injuries which I won't bore you about here. However, since January this year I have resumed my training with the aim of running my 6th Paderborn Easter Half Marathon here in Northern Germany. This is the oldest race in Germany and started just after the end of World War 2 and attracts 11,000 runners each year. Paderborn is a lovely city, very similar to my home city of Salisbury with a fine Cathedral (Dom) and lovely countryside. The Paderborn Easter Half Marathon always falls on Easter Saturday which is normally a good time but for me, it was the day after driving back to Germany after a week in Salisbury. Worse - the traffic on Good Friday was horrible all over Europe and Eurotunnel was running a delayed (2 hour) service. Our journey back took 11 hours - not ideal preparation for a half marathon and I didn't get to bed until 1am on the day of the race (which was at 3pm local time). I must admit that I was feeling like a zombie when I woke up later that day but quickly focused for the race - otherwise Terry would have given me a hard time! I left the family at home (wife Judy and children Katie, Jamie and Millie) and headed to the race start. As with most things here, German efficiency kicks in with a free park and ride service for all runners from the outskirts of the city to the race registration and start. I arrived an hour before the race to take in the atmosphere, meet other runners and get ready for the two lap race. I managed to squeeze near the front at the start and set off at a good pace. I was hoping for a sub 1:35 time (I'm 53) which was in keeping with Terry's times at my age - I told you he inspired me! The temperature was 6C, cold but sunny so ideal for running although the wind was strong at times. That being said, a Hardley club vest was worn for probably the first time in Germany? I went through the first lap of the half marathon in 42:30 so it was looking good. On the second lap I admit to feeling tired from the drive back the previous day and I lost concentration at 15K and somehow 'lost' 2 minutes. Although I finished very strongly, I couldn't get back those 2 minutes so my finishing time was 1:33:08. I was very pleased with the result but I did feel a little race rusty but I think I can knock 2 minutes off in a future half marathon. At the end of the race I received a cracking medal and technical T-Shirt + (as is the custom in most German races) a glass of German beer! All in all, a good day at the running 'office' but boy was I tired! More races to follow later this month and I have the BMW Berlin Marathon to build up for in September. Thank you to all the members who attended the AGM on Monday. The minutes will follow when they are available. Members will be pleased to hear that subscriptions have been held at their current level of £10. EA membership, for those who want it in addition, has gone up from £10 to £12. Clubs are allocated places depending on how many members are registered with England Athletics. We were allocated two places and we awarded them to Carole Bailey and Ben Andrews with Kim Shiels and Mike Kelly being reserves should any of the two not be in a position to run the race. An Interactive Workshop to present Professor Bruce-Low: Sports and Exercise Scientist. Everyone is invited to come along and meet Professor Stewart-Bruce Low (PhD). Stewart is a Sports and Exercise Scientist and Laboratory Director at The Southampton Solent University. This will be an informal question and answer workshop, so bring along those questions and be prepared for an evening of Stimulating Discussion! Look forward to seeing you on January 28th Wednesday 7pm in Studio 3 at Applemore Recreation Centre. Please contact Club Coach, Chris Harris (see Contact Us tab above) if you wish to attend! The Hangover Hobble was all very jolly! We all ran together for 5.5 miles. Although temperatures were 9 degrees C there was ice in the streams that the hardened ultra runners managed to find! The walkers enjoyed the walk , made even more special as Sue's little 5year old granddaughter joined the group . Of course we all finished in The Drift, the coffee was delicious!! Except for those ultra runners, who of course ran home! Happy New Year & thank you everyone. Our next Annual General Meeting will be held on Monday 2nd February at the Waterside Club (in the Cadland Room) between 7.30pm and 9.30pm. It would be fantastic to see as many of you there as possible. I'd like to take this opportunity to let you know in advance that I will be standing down as Chairwoman at the AGM. I've thoroughly enjoyed the last two years but, since having Amber, I just don't have enough time to do the role justice. So, the role of Chairman/woman will be vacant from February 2015 and all of the other committee positions are open to offers! There are job descriptions available on the "committee" page of our website (see tab above) but please contact one of us if you'd like more information. We could definitely do with one or two more people on our social committee. Also, if anyone has anything interesting they'd like to share with the rest of the club, then we usually have time for a short presentation/slide show at the end of the meeting. Previous topics have included Jeremy conquering the Everest Marathon, endurance running, tour de Mont Blanc etc. So I look forward to seeing lots of you at the AGM but in the mean time, I'd like to wish you all a very Merry Christmas and a Happy New Year!